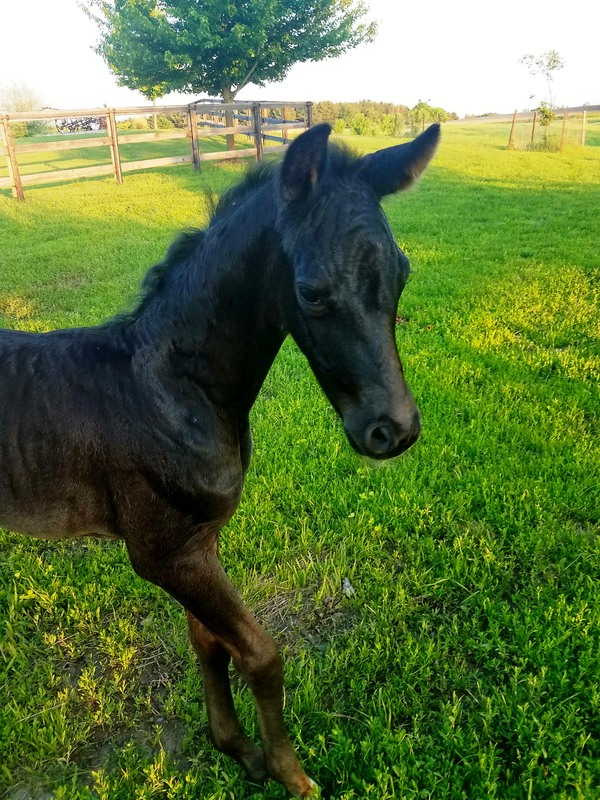 Red Robin gave us a beautifully elegant black filly in 2018. 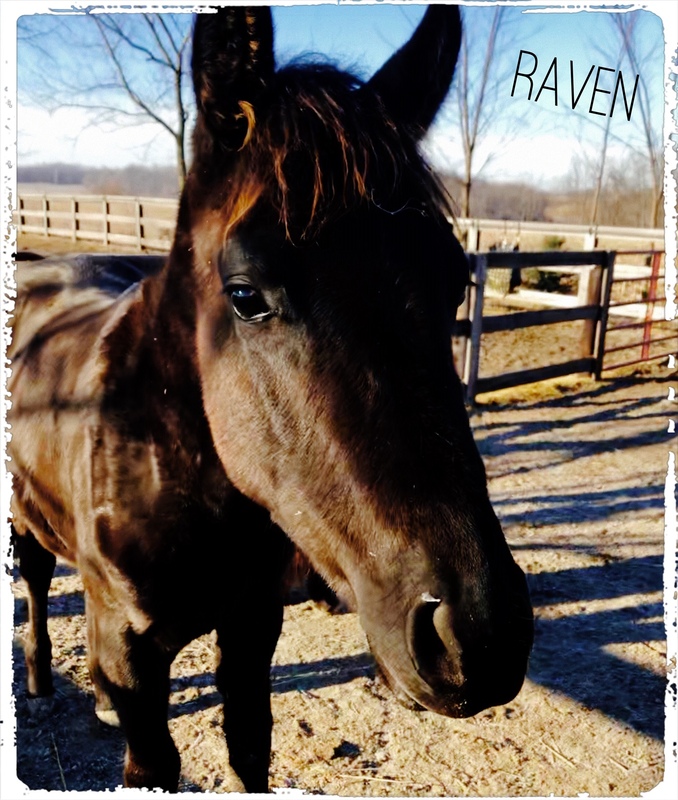 "Raven" is being retained as a future riding horse and broodmare with plans to breed at 3, foal at 4, and complete AHS mare performance testing at 5. She is by the Celle stallion Fuerst Rousseau (Rousseau/Weltmeyer) and out of our reliable Red Robin (Rienzi/Donnerhall/FeinerStern). 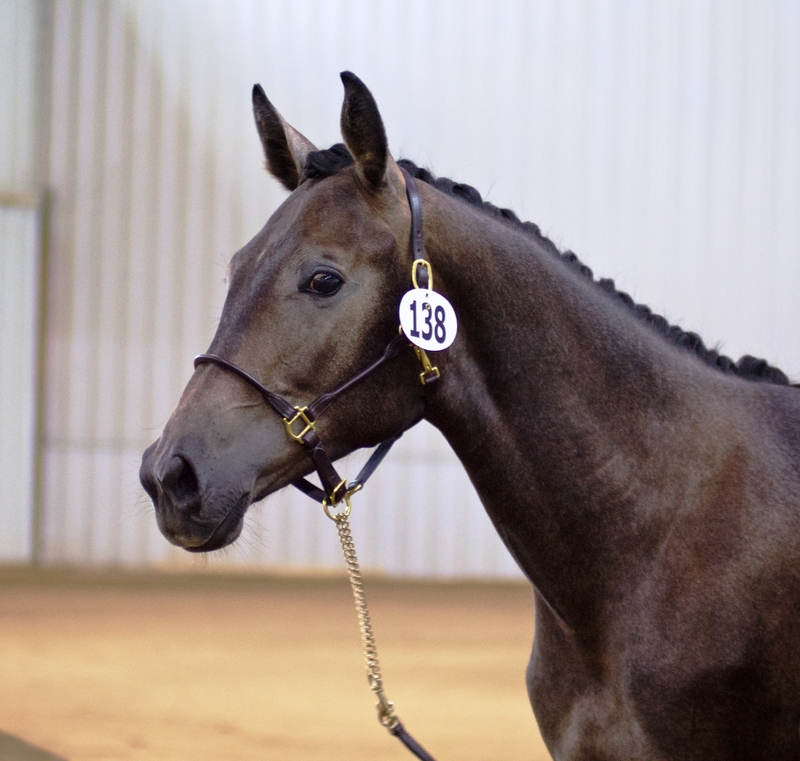 We have high hopes that she will someday be an AHS Premium mare for our program. 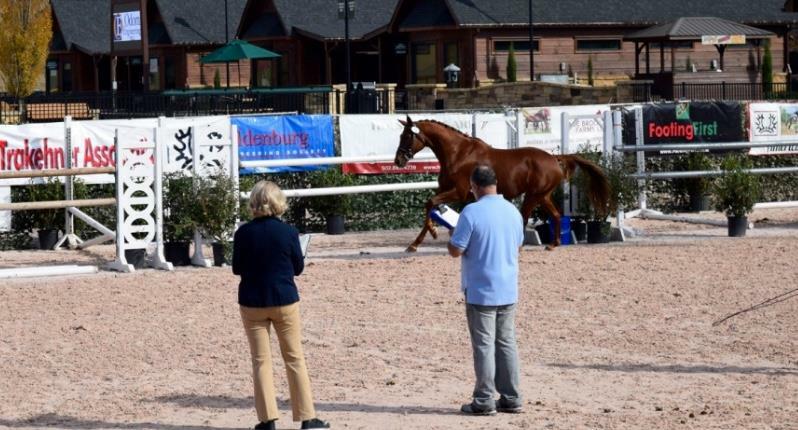 Furst Rousseau has a dressage breeding value of 133, a rideability score of 9 and was shown successfully in FEI young rider classes after standing at stud at Celle. "At the end of the 70 day test Reserve Champion Furst Rousseau was obtained by the State Stud Celle. This is a very elegant and noble black stallion. 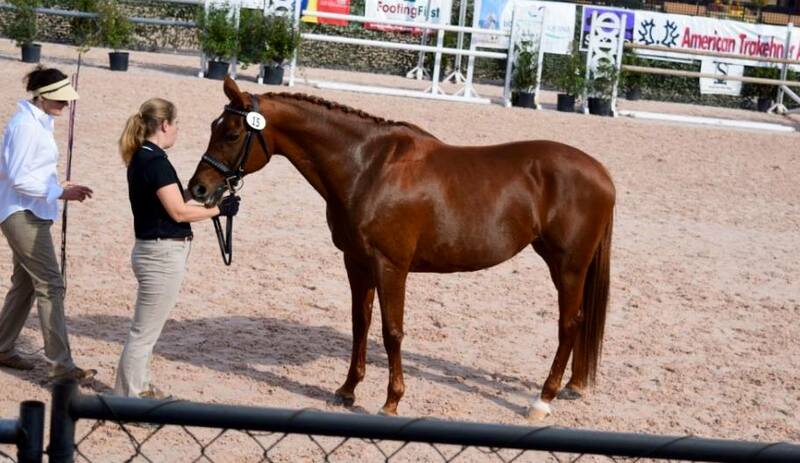 He is half brother to Dramatic by Don Frederico who was 5 yo Champion of Young Dressage Horses in 2008. 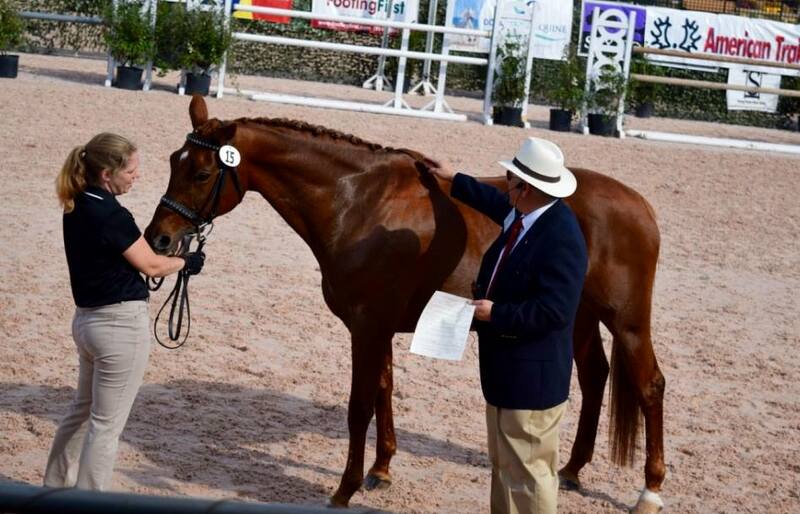 Furst Rousseau completed not only a fantastic stallion performance test, his close relative Barclay (Belissimo M – Prestige Pilot – Grenadier), was also awarded with highest scores and he finished this test as winner. Both horses have a mare line that has produced many licensed stallions, the damline of St Pr St Geranie by Grenadier – Arsenik, which originates with the family Wolgarune, father Wohler. 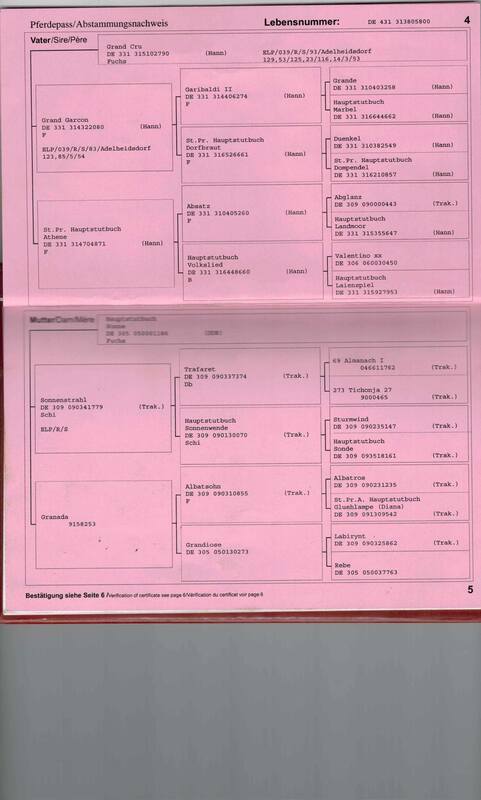 This represents one of the best mare lines in Germany." 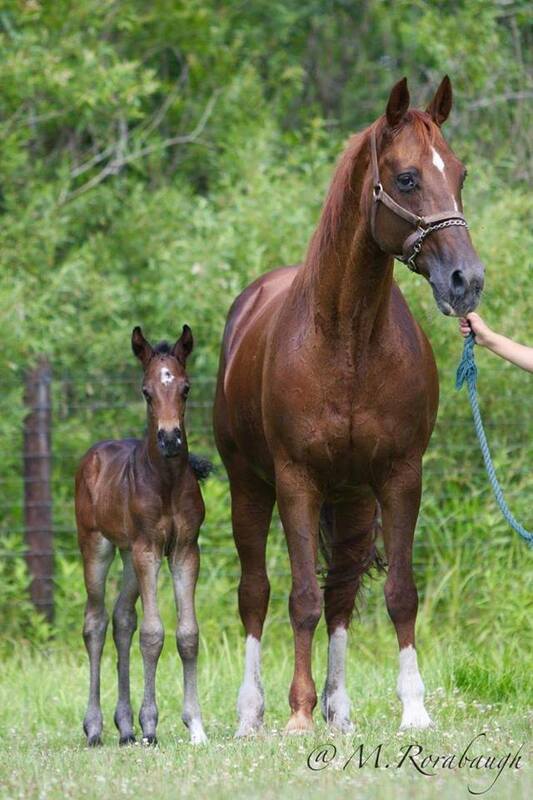 (from International Horse Breeders). 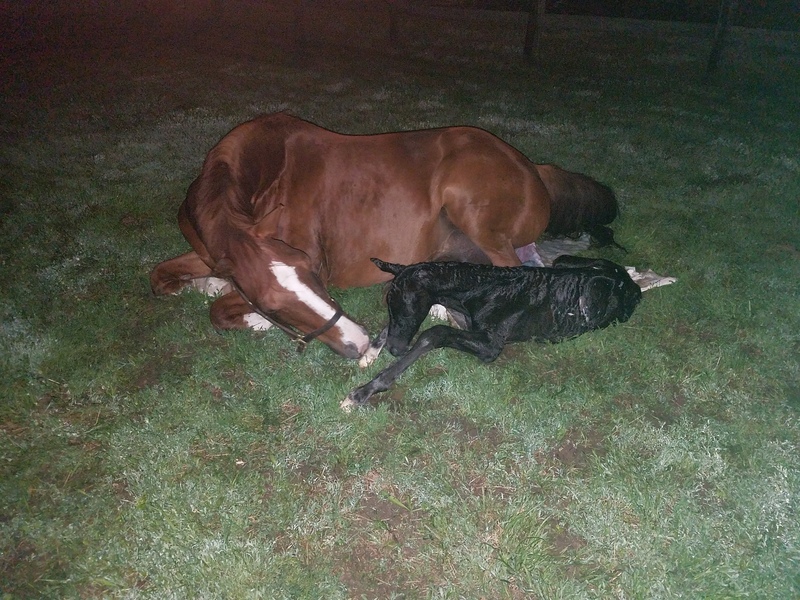 See SIRES page for more information, photos and videos. 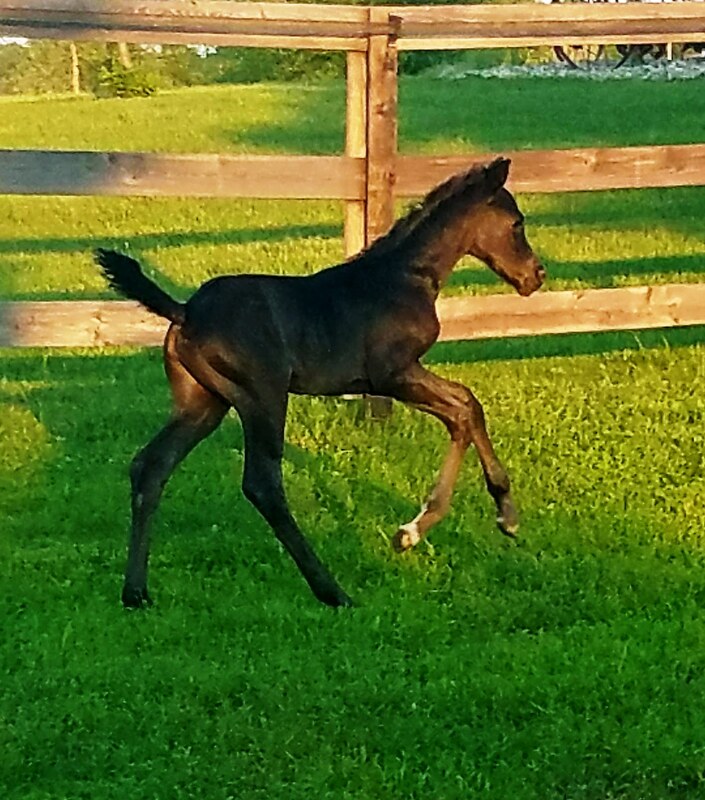 This elegant and kind 2017 Hanoverian filly fits so many aspects of the modern Hanoverian horse. 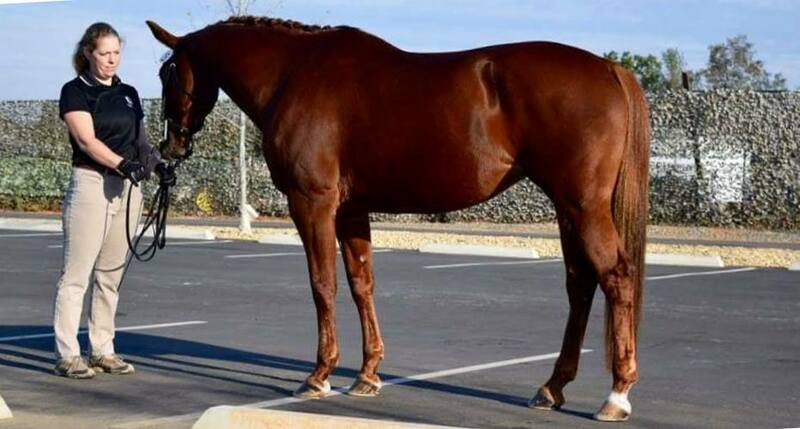 We plan to breed her at 3, foal out at 4, and complete AHS mare performance testing at 5. 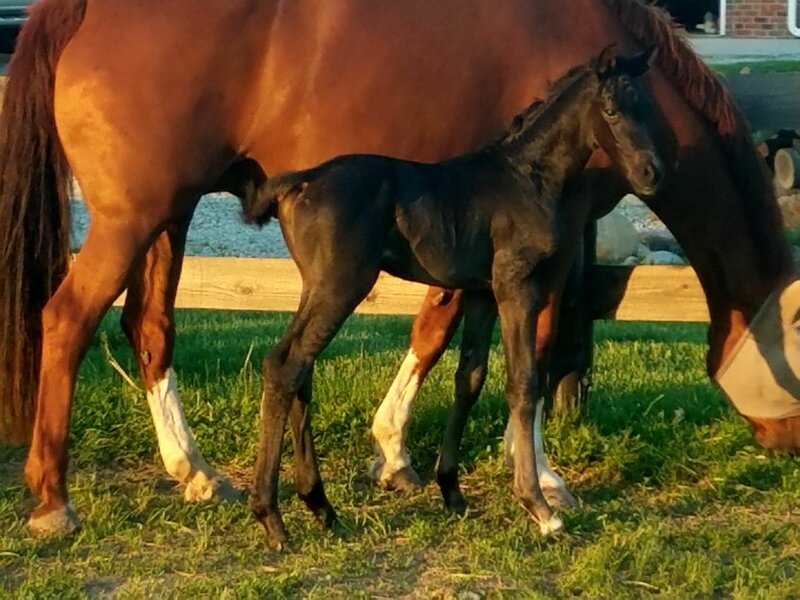 We have high hopes that she will be an AHS Premium mare for our future broodmare herd. 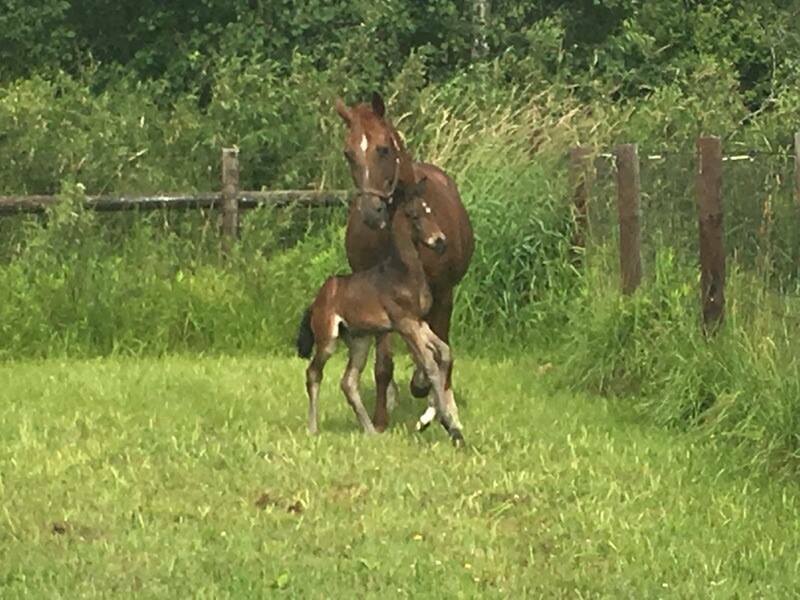 She is by Trakehner E.H. Herzensdieb (Tambour) out of Elite Eligible Hanoverian mare Weidentanz (Wolkentanz/Borneo/Grunewald). 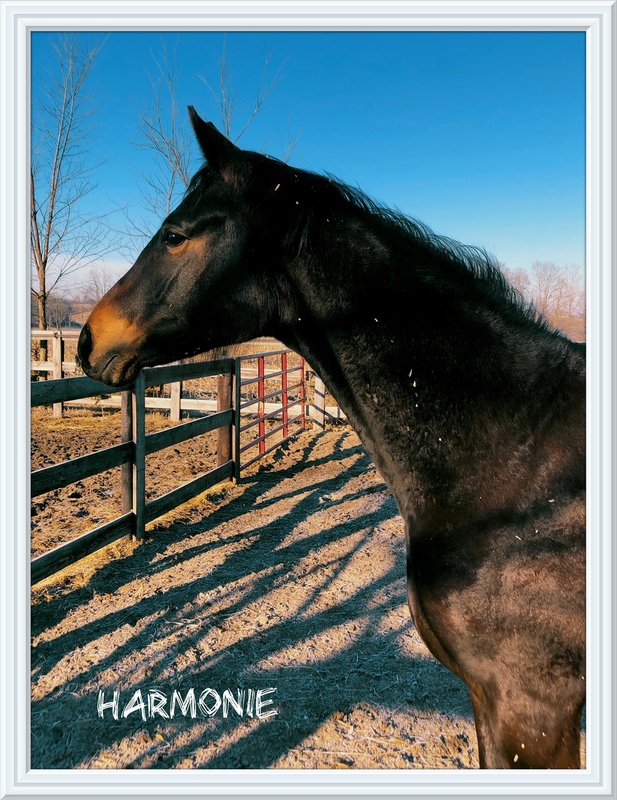 Harmonie will be presented at the AHS Futurity in July 2018 and shown at USDF in-hand shows during her youth. 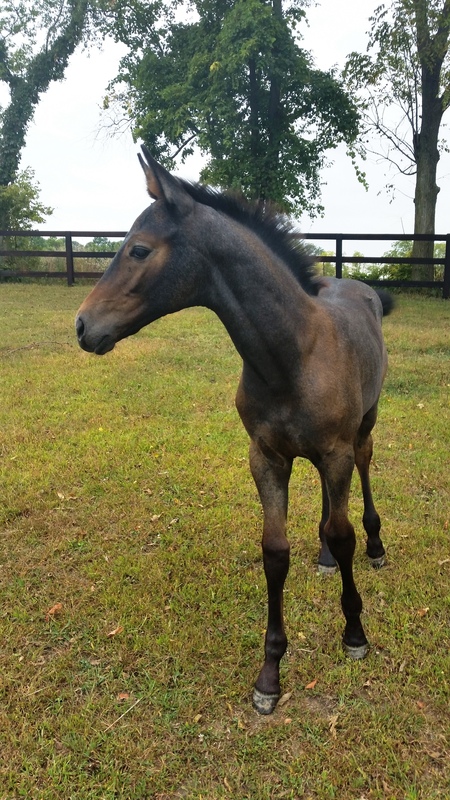 This filly has an exemplary temperament - calm, gentle, and with movement as her name suggests... with harmony! 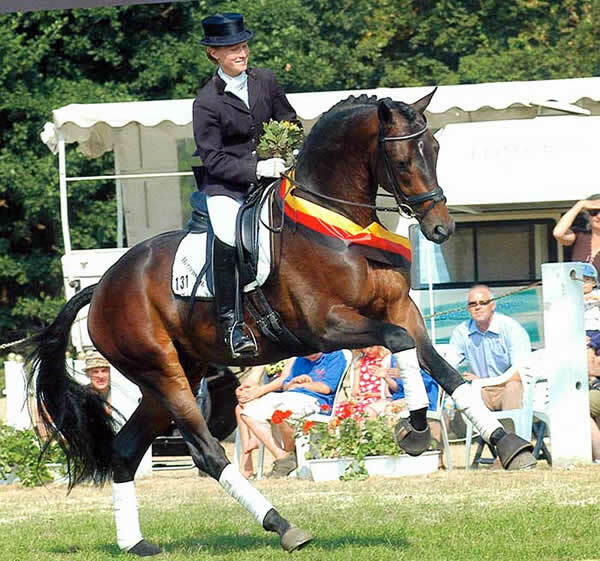 Sire EH Herzensdieb "was the 2003 champion and crowd favorite at the 2005 Trakehner licensing in Neumünster, Germany, Herzensdieb finished his stallion performance test as reserve champion and won the Trakehner Championship for 3-year-old stallions in the same year. He is a Bundeschampionate qualifier. 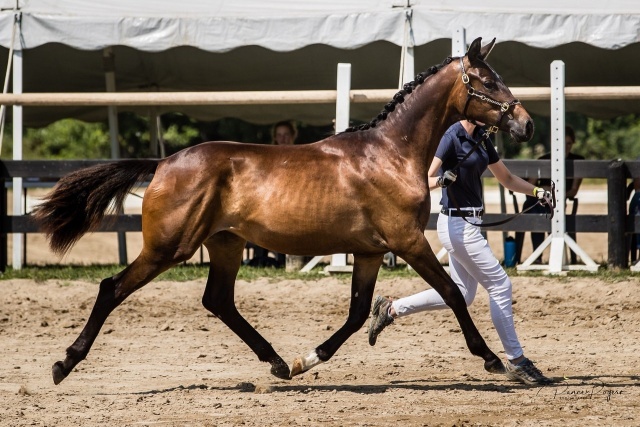 The striking bay stallion's intelligence and rideability allow him to flourish in his upper level dressage training, and his athleticism gives him talent over fences with beautiful scope. 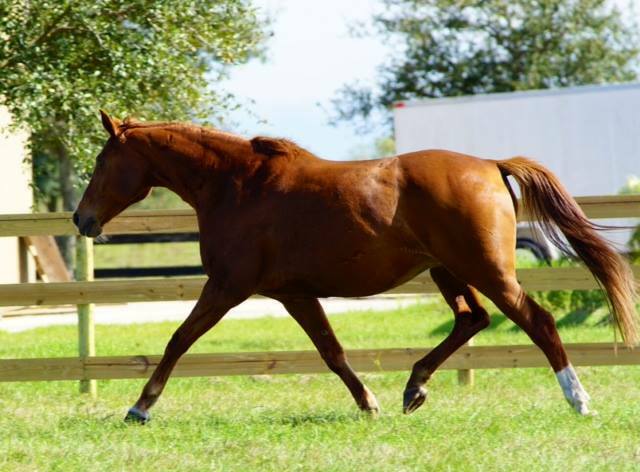 His correct gaits are expressive with the ability to collect. 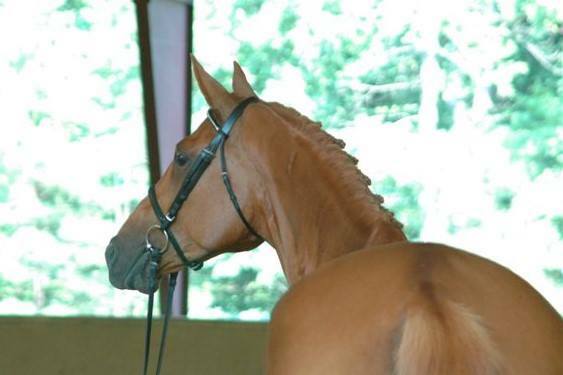 Herzensdieb has a FN breeding value dressage of 142 points and is in the top 10 percent of German dressage sires. 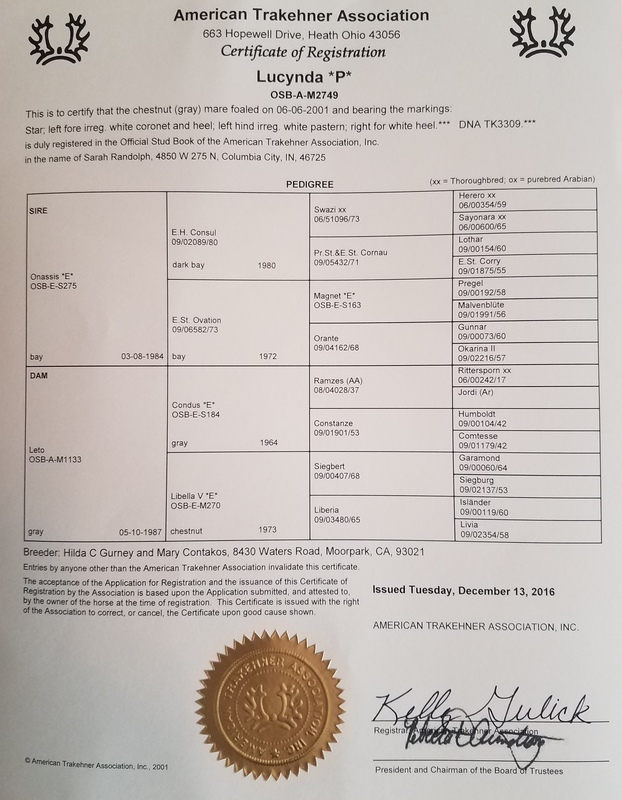 He was honored with the prestigious Elite Hengsttitle (E.H.) in 2013 by the Trakehner Verband, and he is currently one of the few E.H. awarded stallions that are actively breeding in the United States." (from Leatherdale Farms). See our SIRES page for more information, photos, and videos of Herzensdieb. 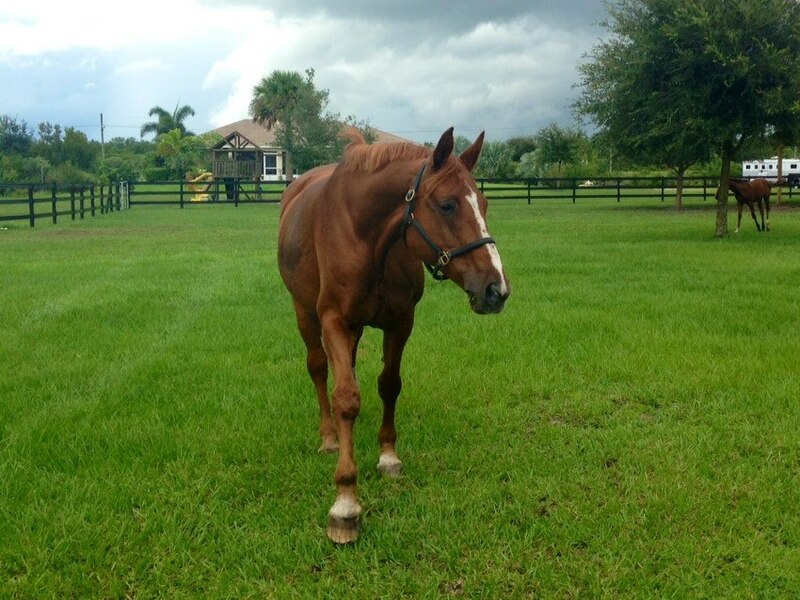 Dam Weidentanz is an imported Elite-Eligible mare. 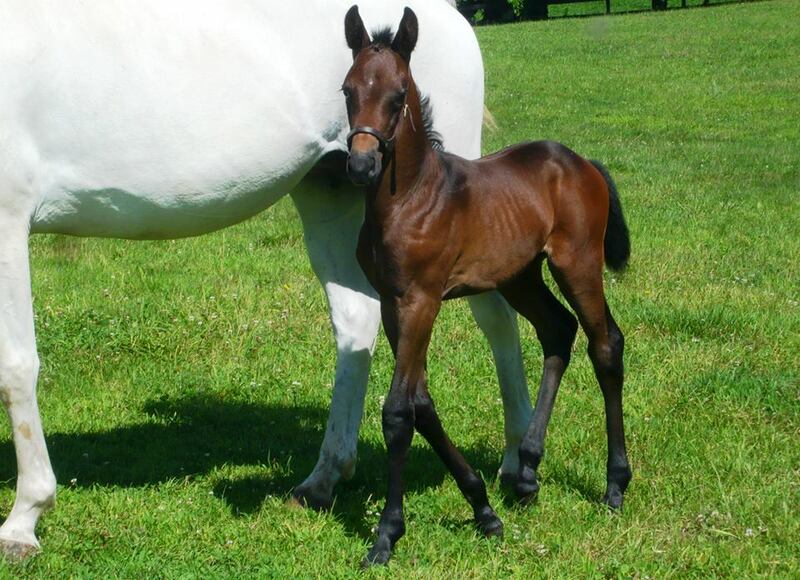 Full of substance, power, and high intellect, we are very lucky to have one of her fillies her at Telos Farm. 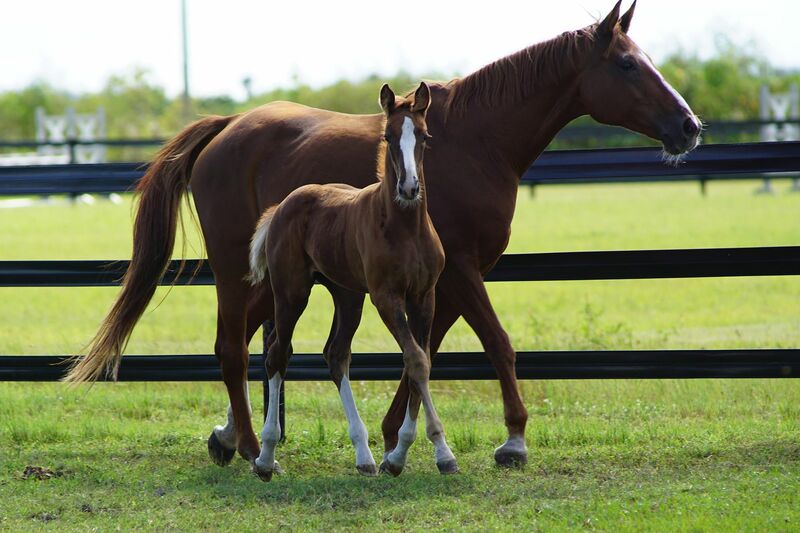 Newborn foal photos courtesy of breeder Christy Schulthess. 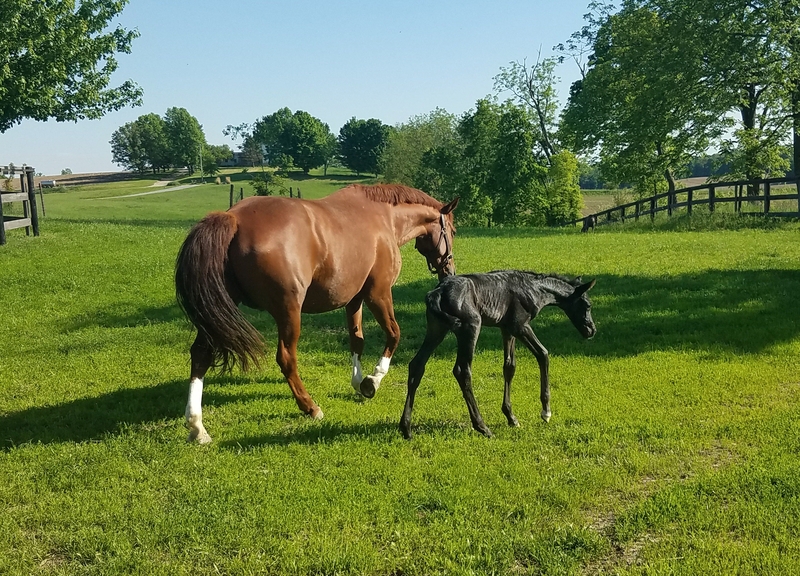 A homebred "keeper filly" and broodmare prospect for us! 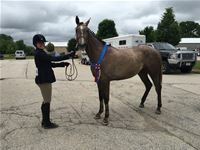 'Talhia' is out of our Trakehner mare Hallalujah Anyway, a seasoned and successful Dressage competitor, loaded with athletic jumper heritage. 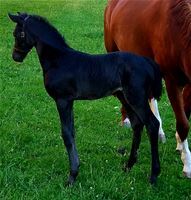 Talhia is sired by the German imported Oldenburg Tantris (GOV) who is by Traumdeuter (TRK) and with the mare line of Rubina-Aktuell, which consistently appears in stallions within the top 10 WBFSH rankings for dressage including several from Blue Hors Stud. 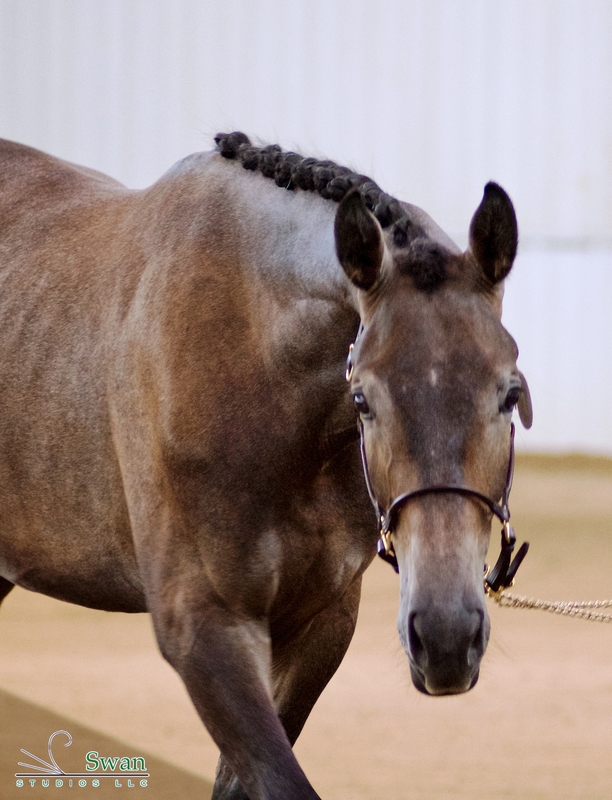 Tantris competed in FEI dressage well into his 20's and is known around the US for his rideability and passing on feet with tough soles and good angles. 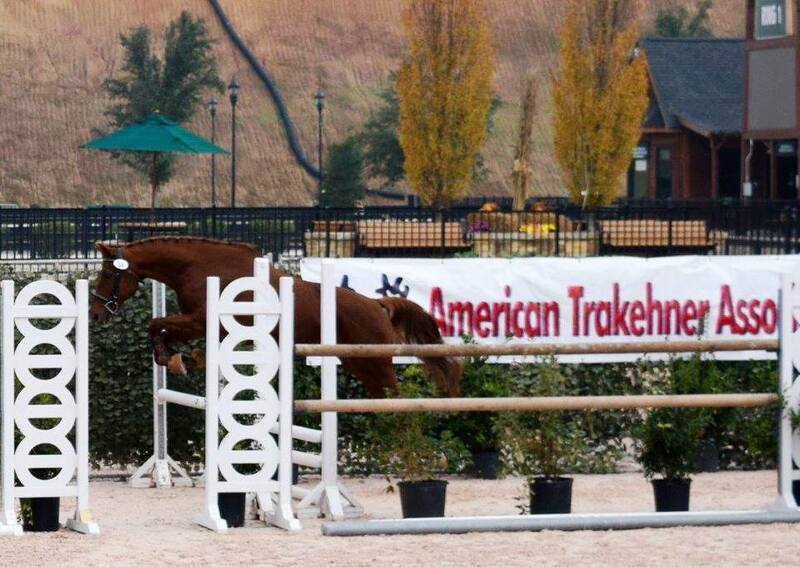 Talhia is no exception and in fact we purchased her dam specifically for this cross with Tantris. 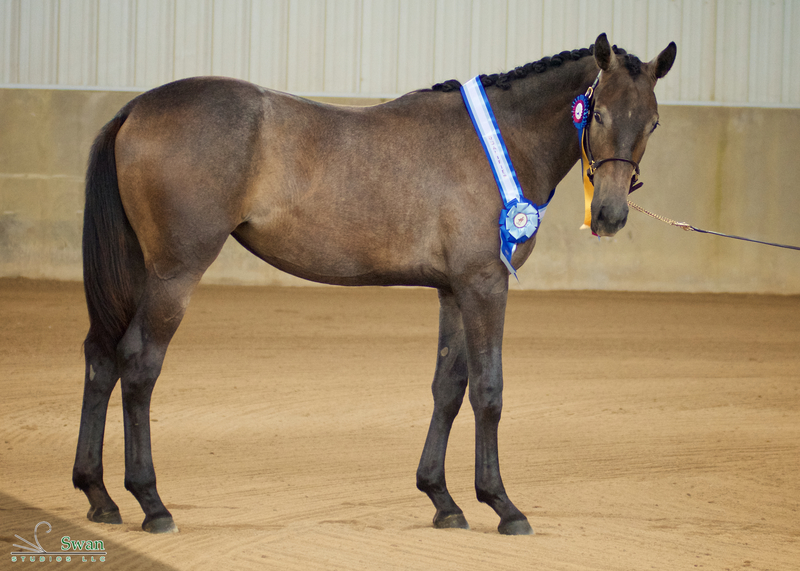 Talhia received all 8's (premium level scoring) at her weanling ATA inspection with comments about her lovely eye and expressive, athletic gaits. 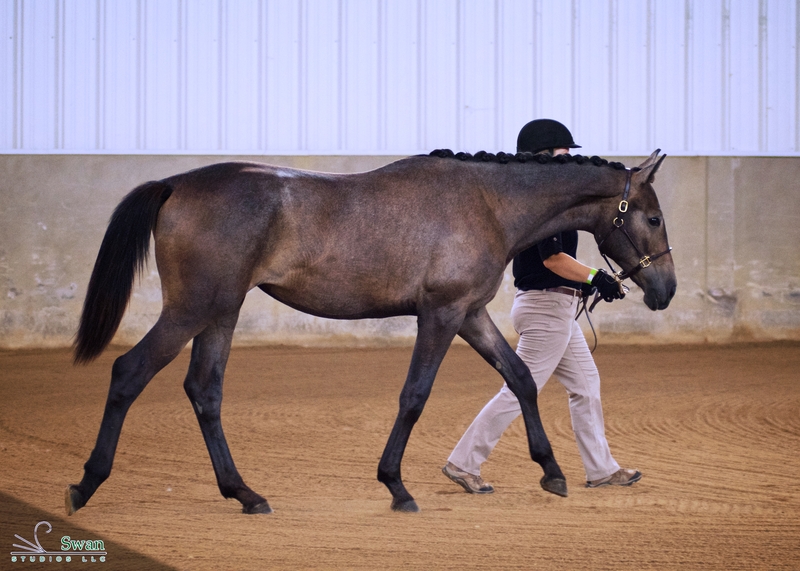 As a yearling in 2016, Talhia scored a 72.6% at a Chicago area USDF in hand show and was the highest in-hand score of the show. 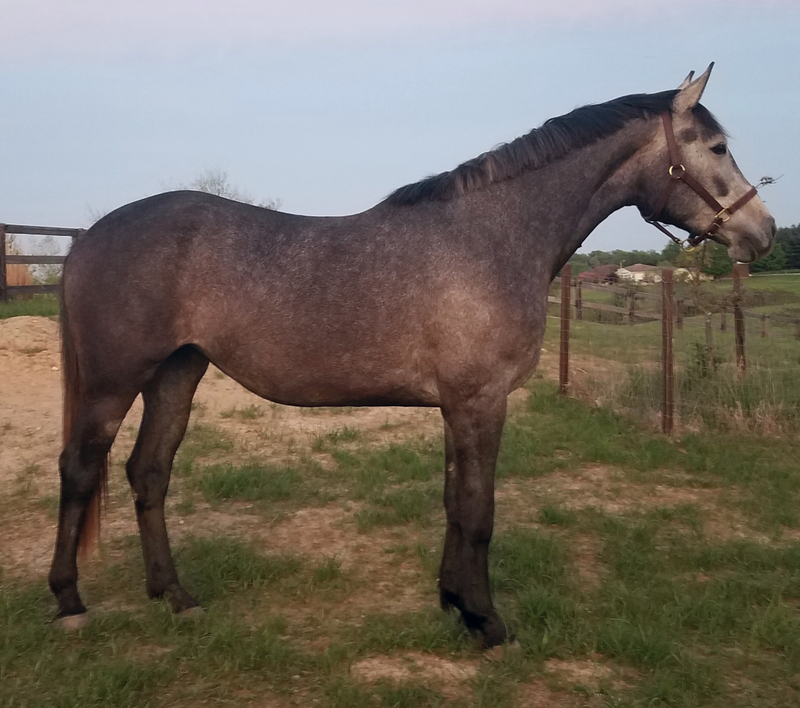 She will be bred as a 3 year old and then taking some time off to compete with Sarah in young horse and material classes for a few years. 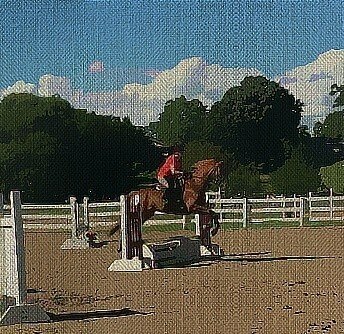 We also hope to complete her Mare Performance test and mare inspection with ATA when she is 5. 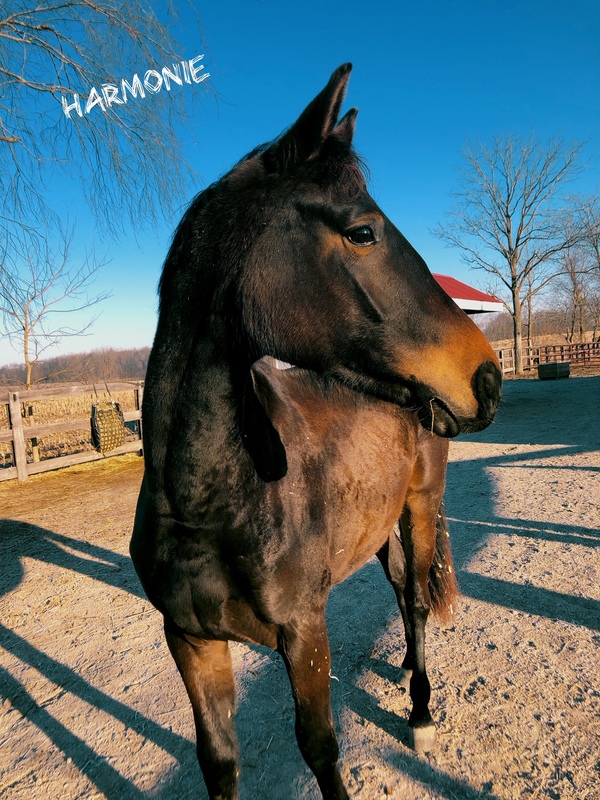 Talhia is in foal to Rascalino for 2019! 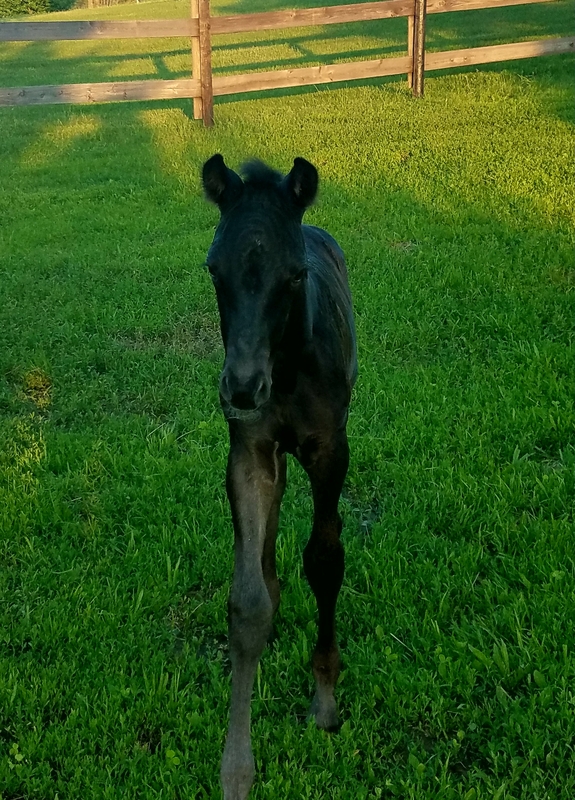 Colt or Filly option available in-utero. 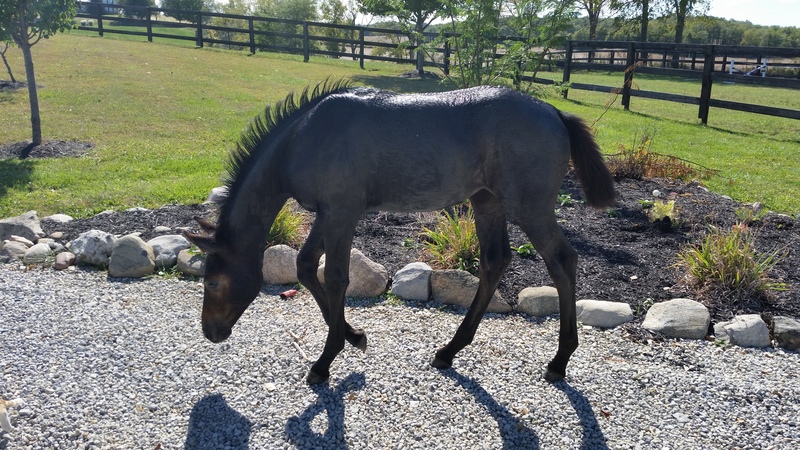 This foal is expected to have amazing gaits and strong conformation for dressage. 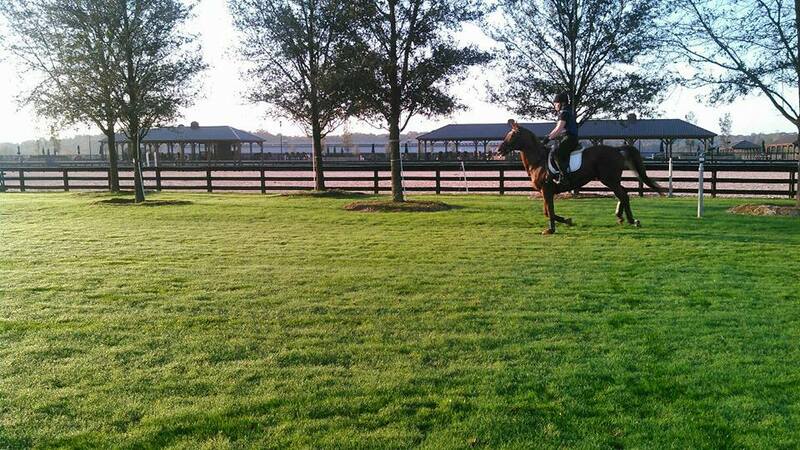 Talhia will take a year or two off to start undersaddle training before returning to the breeding shed. 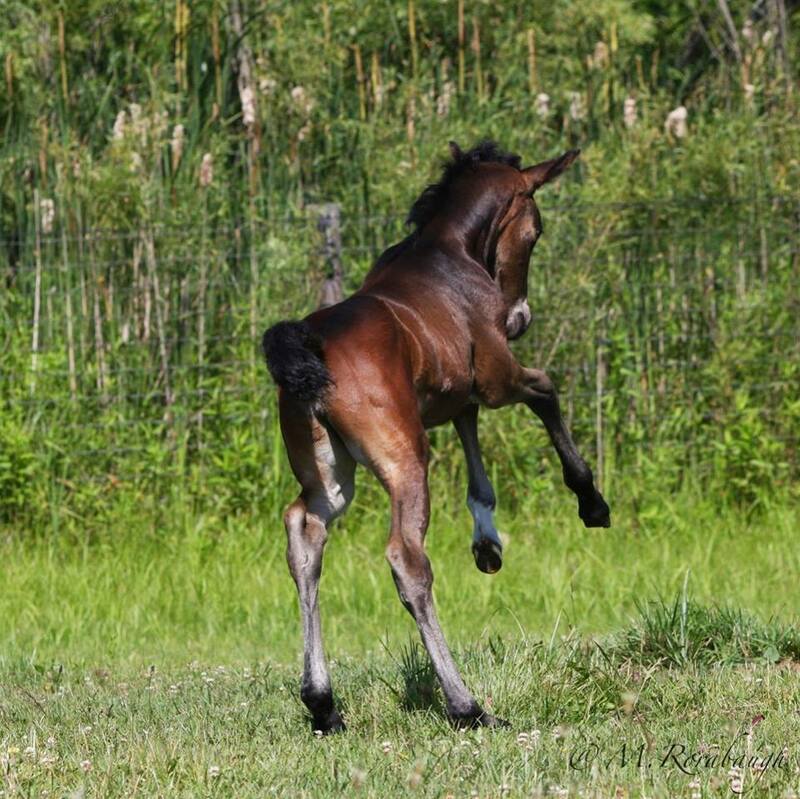 Currently selecting a Trakehner event sire, for a 2020 foal! 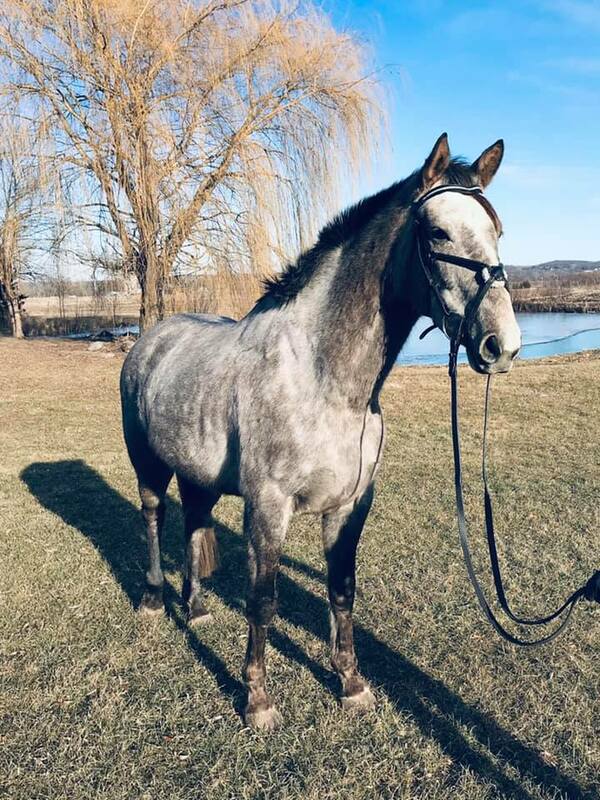 This lovely event mare recently entered our program in spring of 2019. 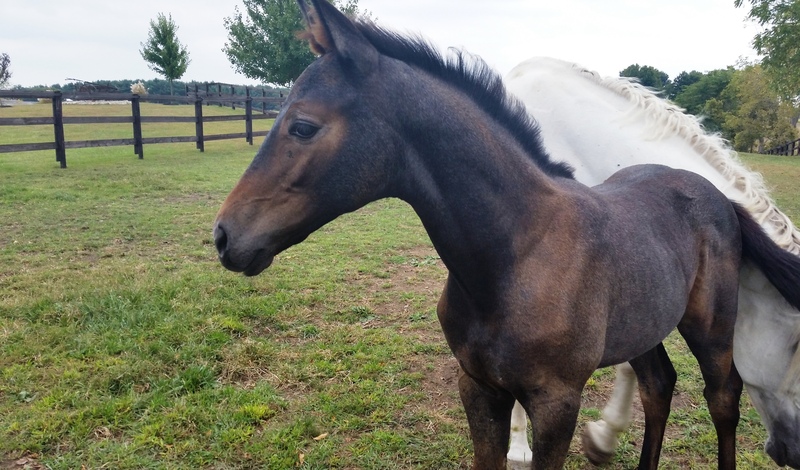 Look for future Trakehner event foals from this mare! More information about Luna's heritage coming soon. 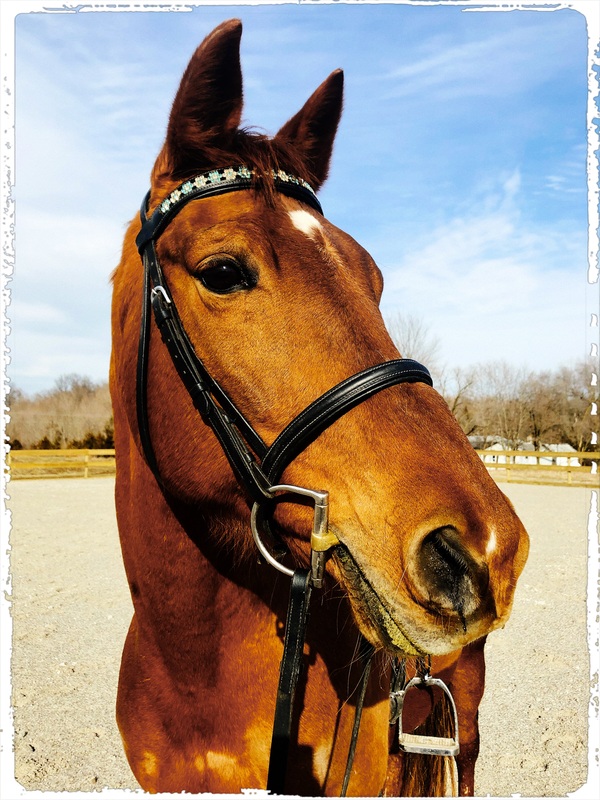 Retired from breeding, but back under saddle for endurance, dressage, and jumping. 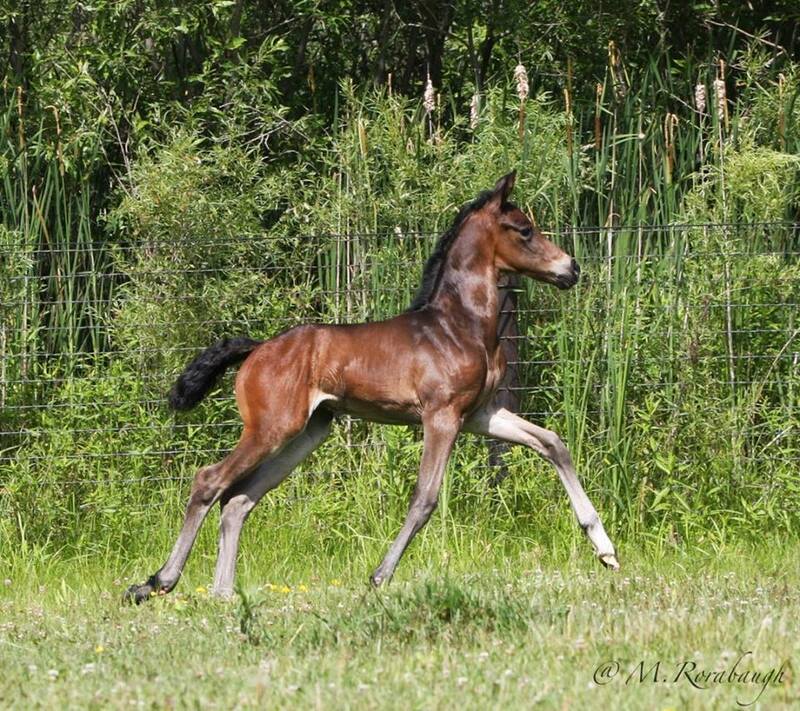 May try an Embryo Transfer foal in 2019 to Hancock *Pb* or Tantris! 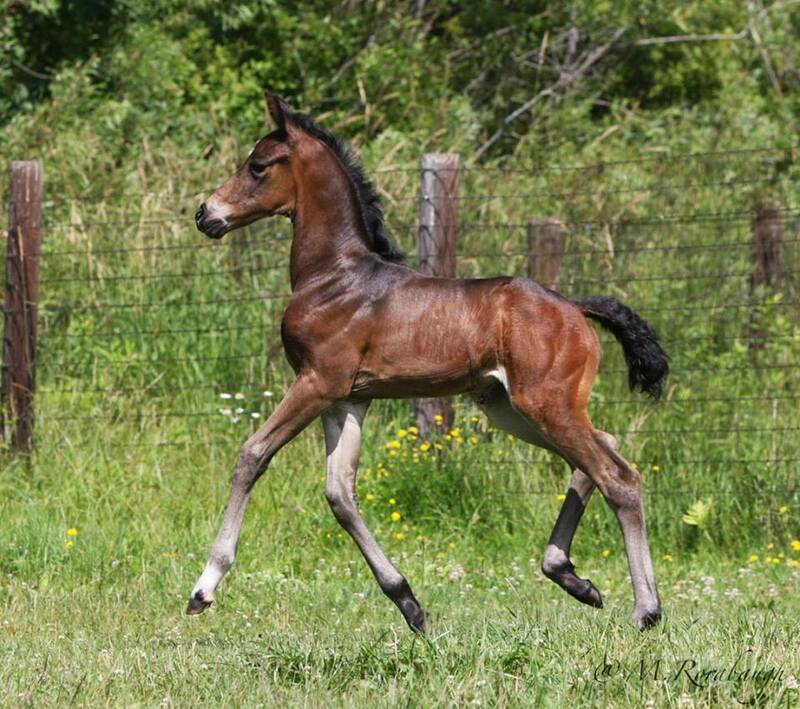 By Onassis *E* (sire of Tatendrang *Pb*). 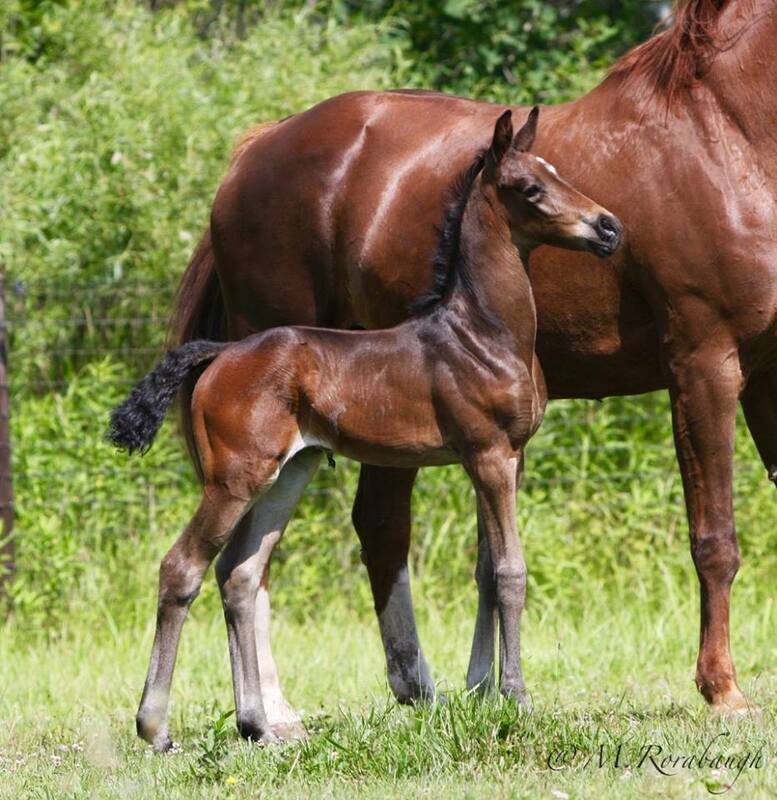 Out of Leto, a full sister to Grand Prix champion Leonidas *Pg *E*. 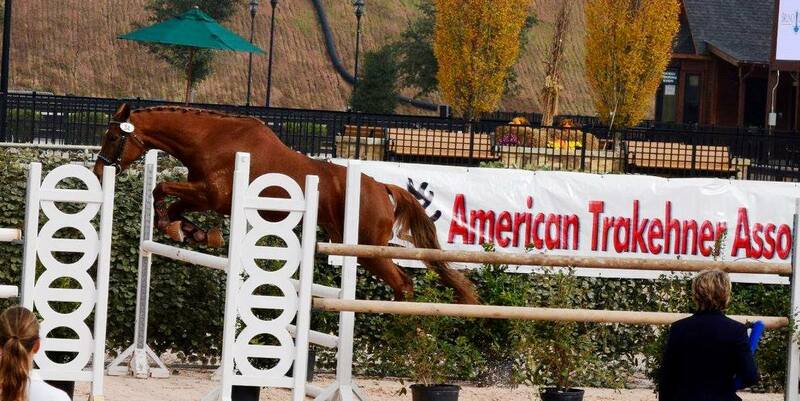 This mare was bred by Hilda Gurney and had a successful jumper career on the West Coast, including the honor of the ATA low jumper horse of the year in 2011. 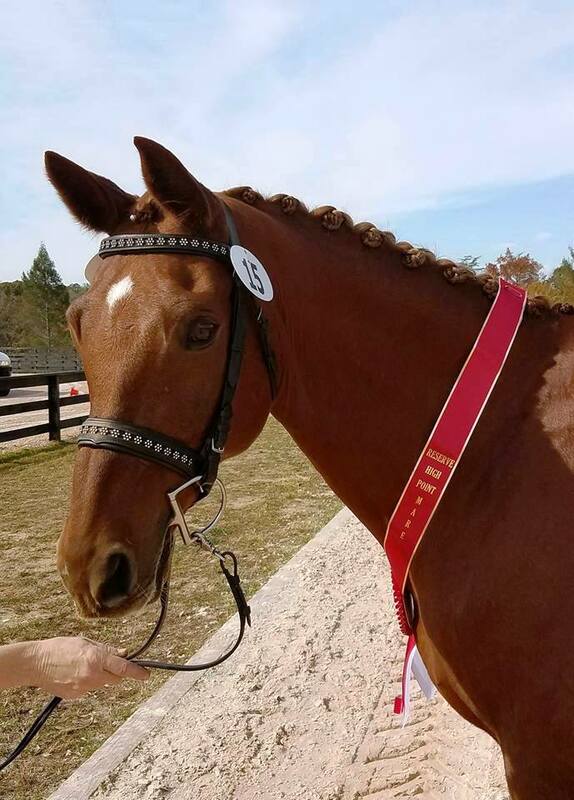 She completed her Mare Performance test in 2016 and is now known as Lucynda *P*. 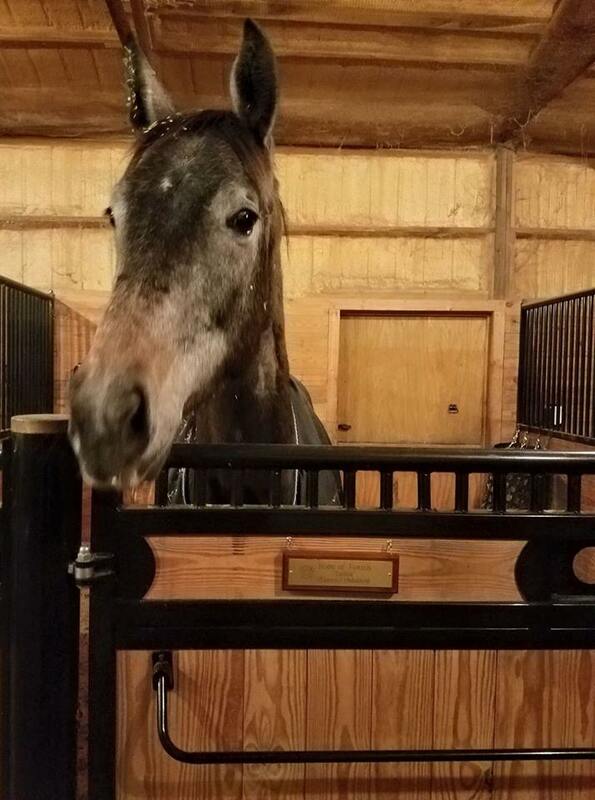 Lucy is an extremely athletic and courageous mare. 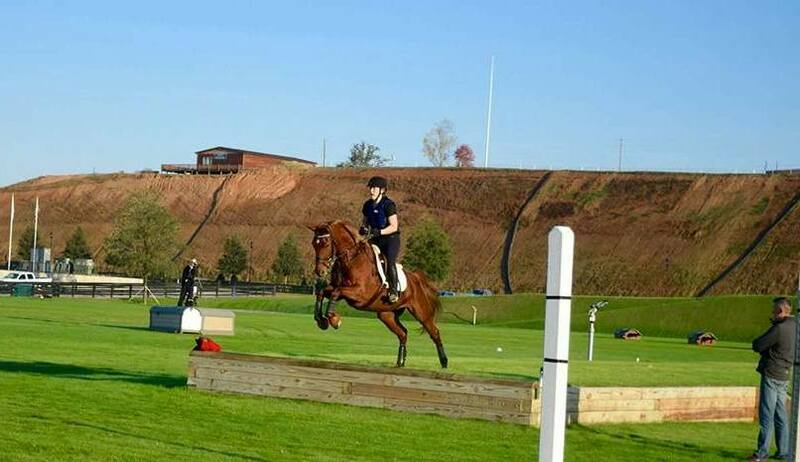 In addition to being a careful jumper, she showed great promise for cross country at an Andreas Dibowski clinic, navigating various cross country fences for the first time ever with relative ease. 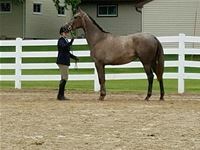 She has naturally uphill and expressive gaits for dressage, completing the ideal for the versatile Trakehner horse. Below photos are courtesy of Pearlie Rohrbacher, Michelle Meehan, Anissa Cottongim, and Telos Farm. 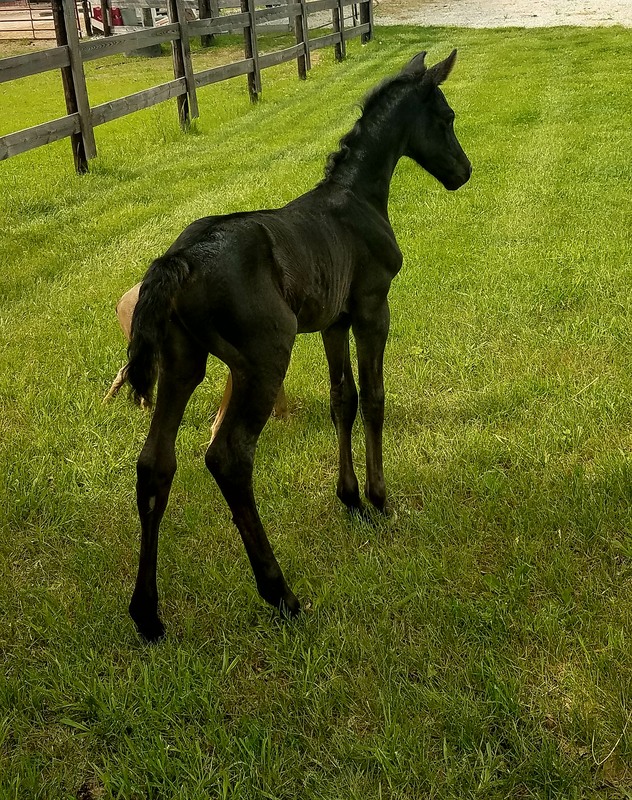 Gala will be bred to EHHerzensdieb for a 2020 foal! 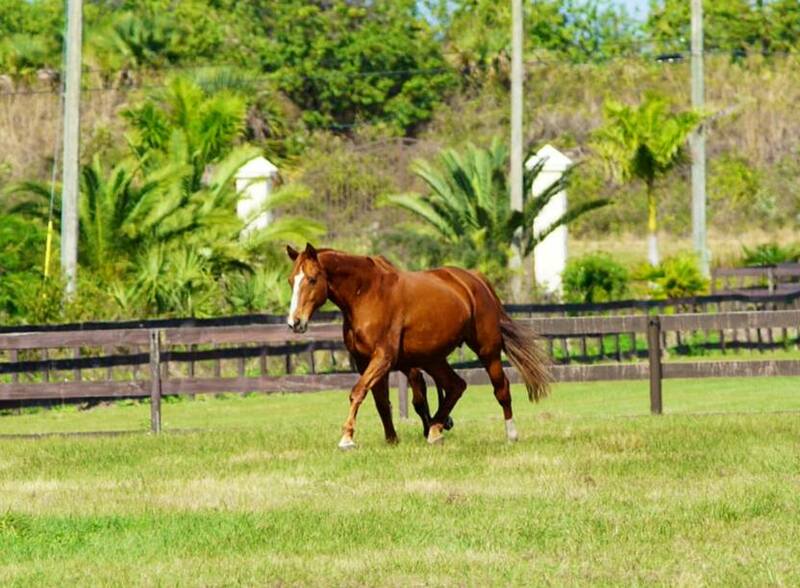 Gala is the dam to BWP licensed stallion Citadel VS. More information about Gala and her heritage coming soon!